6Sutphen began in 1890 as a dream of C.H. Sutphen. His son, Harry, took an interest in the business and carried it on until his death. In 2015 Sutphen celebrated its 125th year of operation; making it the oldest continuously owned and operated fire apparatus manufacturer in the country. Never reorganized, owned and operated by anyone other than a Sutphen, family atmosphere is apparent. departments could not afford new apparatus, especially aerial trucks. That together with Dan’s mechanical knowledge led to the idea to begin refurbishing used fire trucks, in particular Sutphen aerials. Through the years Dan has refurbished more than 30 Sutphen aerials. and grow the dealership. 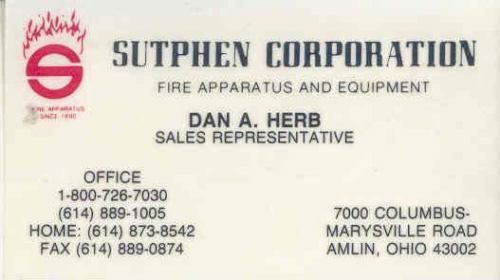 Herb Fire has been a top 3 dealer in total sales for Sutphen each year since. A special thanks to all members at Indianafiretrucks.com, Keith Cooper, and John Nyerges for their permission and use of a selection of the exceptional Sutphen fire apparatus photos that appear on this website.